I realize that it has been quite some time since I last wrote. I’ve actually been pretty busy as of late, so writing took a back seat to everything else. I love writing, but unfortunately, I need quiet time to concentrate my thoughts into words, and I seem to have been lacking in that area. The good news is that a LOT of stuff has happened, which means I have plenty of material for new blog posts! 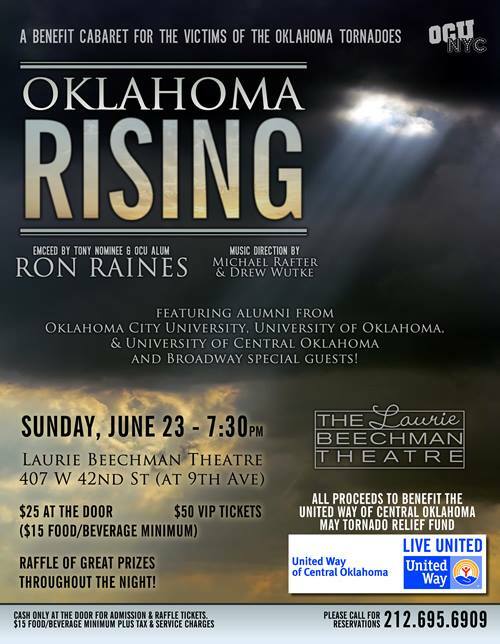 The major time-sucker of my life since around the end of May until now has been a benefit cabaret I’m helping to produce for the victims of the devastating tornadoes down in Oklahoma. As many of you know, I went to college in Oklahoma City, so it was very difficult to see the images of destruction and heartbreak coming from a place I know to be filled with such wonderful, giving people. My university has a large alumni network here in New York, so we decided to do something to raise money, and we decided upon a cabaret since we’re all (mostly) performers. In addition to that, I’ve also been in rehearsal for a reading of a new musical entitled Walk that’s written by a classmate of mine named Ben Harrell. And of course the staged reading would be just a few short days (June 27 at 8 pm at the Green Space in Long Island City) after the benefit we’ve all been working so diligently on. As you can see, I’ve been having a busy month. I’ve also been traveling a lot lately. In mid-May, I finally went out to Los Angeles to visit my older brother and a bunch of my college classmates. I’ll detail that experience in an upcoming blog. And this month, I took a little weekend trip down to Washington D.C. to visit my oldest best friend for a fun-filled and educational vacation. And let’s not forget that in the short time I’ve been away, Kim and Kanye had their baby, Amanda Bynes went crazy, and Girl Meets World officially got picked up for 2014 (as if it wouldn’t). I’m back, kids, and I’m gonna do my best to become a little more regular…on the writing front that is, so you and your Activia can go home Jamie Lee Curtis. I’m trying to become regular again…just like Jamie Lee. Regular at WRITING.